Here it is: the second Wednesday of my journey into Storytelling. Please check out my previous Storytelling posts here. And my 365 Reviews here. 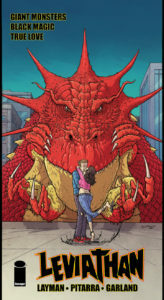 Each Wednesday I will be bringing you four reviews from four #1s that hit shelves that day. It’s NCBD (new comic book day) for those of you that do not know, so get excited because I have some unique tales for you today! I will also shoot for four different publishers; I know two of these are Dark Horse, but one is Disney Dark Horse, and one is Berger Books Dark Horse. 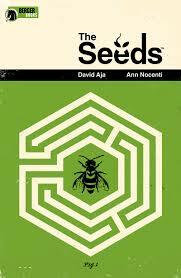 Man do I love me some David Aja art! This book looks amazing! The simple yet complex lines. Its monochromatic gray-green. The dots that make it look like old newspaper print (it’s called halftone…just looked it up). Fascinating. Don’t ask me what’s going on as of yet. It’s issue one of a four-issue mini-series, and I hope each issue fills in the gaps and confusion left from issue one, but you know what? If it doesn’t…who cares. The book is that interesting and looks that good. I can tell you that it does take place in a walled-in world where the outside world is tech-free, and the inside is a bit crazy. Looking forward to these four issues. Pull list activated! I still think Frozen has the best soundtrack of any Disney film ever. Not my favorite, but those songs are catchy as hell. 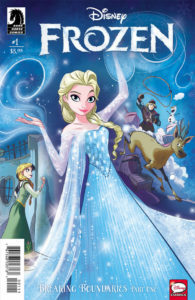 Seeing the Frozen comic on the shelf, I had to check it out. Wanted to see what Disney is doing with original story in comic form. And to be honest, this issue lacks any serious story, which is cool for younger readers; I get it: keep it simple. But what called me to this issue is the art, most specifically, the coloring. It’s beautiful! Props to colorist Amanda Duarte and Kawaii Creative Studios for creating as detailed color in digital art as I’ve seen in a while. If you get this one or not, check out the coloring! This issue one of five is mad! The art of Nick Patarra is crazy detailed and exaggerated, with the feel of a Mad Magazine comic. I LOVE the Raid films; if you are a fan of action/fighting films, SEE THE RAID FILMS THIS WEEKEND! 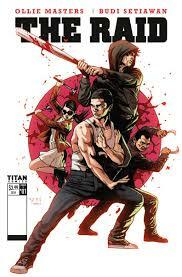 This series takes place during The Raid 2. It features many of the same characters from the film, but the action and pacing of the films do not translate well into the medium. Funny, I’ve been having this discussion a lot lately. Pacing is something that is uniquely different in all entertainment mediums, and this franchise should stay on the screen, even though I’m a massive fan and would want nothing more than to get more Raid. The action sequences are also lost in the medium. I’m understating when I say the action sequences are wild in the films. It’s hard to capture that intensity in comic form. And that’s it for Wednesday two! I’ll also be giving my pick of the week from the four that I review, and that book today is Leviathan from Image…hard to beat that crazy! Check them all out and let me know what you think!